I'm a follower of this blog and love reading it! These twins are super great. I absolutely love this blog. These girls provide excellent insight into their experience of studying abroad in Australia. Not only do they explore well-known monuments such as the Opera House, but they also share accounts of hidden alleyways and daily living. Excellent writing complimented with great pictures. The posts are always a pleasure to read. They're an informative bunch! Being a Canadian interested in going "down under" their posts have provided great insight into the life in Oz! Diverse and interesting topics that keep me keen on wanting more! This is an awesome blog!!! The girls always have interesting and relevant posts on a wide variety of topics. I love their blog! It's really fun to read and interesting. Looking forward to reading more, girls. Love these girls! 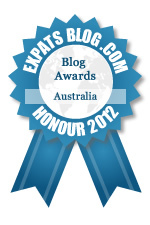 Best bloggers in Australia! Anika and Jo are so expressive and captivating in their travels, it's a (good) surprise to find out what they're going to write about next! It's interesting to see what they're up to - it makes them feel close when they are so far away! Great blog, guys! These twins are so articulate and the blog reflects their adventures and personality very well. They're always so responsive about engaging with the audience as well by always taking the time to reply to each and every comment. I will make a short, but strong statement: THESE GIRLS MAKE ME WANT TO GO TO AUSTRALIA. Stellar blog posts! I've been reading this blog ever since the beginning and I just love it! It's cute, it's fun, and relatable. The girls are awesome! A wonderful collection of experiences and thoughts between two individuals, in a new land. You two ladies make an average guide to Australia much more enjoyable with both of your sense of humour and insightful comments! Keep it up! I love this blog...makes me wish I had a twin!! :( All kidding aside, I love seeing updates because it makes me excited to read what new things the girls have been up to. I love reading this blog.They've always got some new adventure and show sides of Australia I never knew about. Topped off with an easy sense of humour, it makes the whole thing just an enjoyable read. It's the only blog I read! What a great blog. I just found it and already I am hooked on it. Keep up the great and interesting blog girls. Thank you.